Cheese Straws are a Southern favorite. They’re a snap to make, and perfect for nibbling at summer barbecues! This post was sponsored by Sargento® and I was compensated to write it. Regardless, what I have written is my own opinion and experience, and I hope you find it of use. 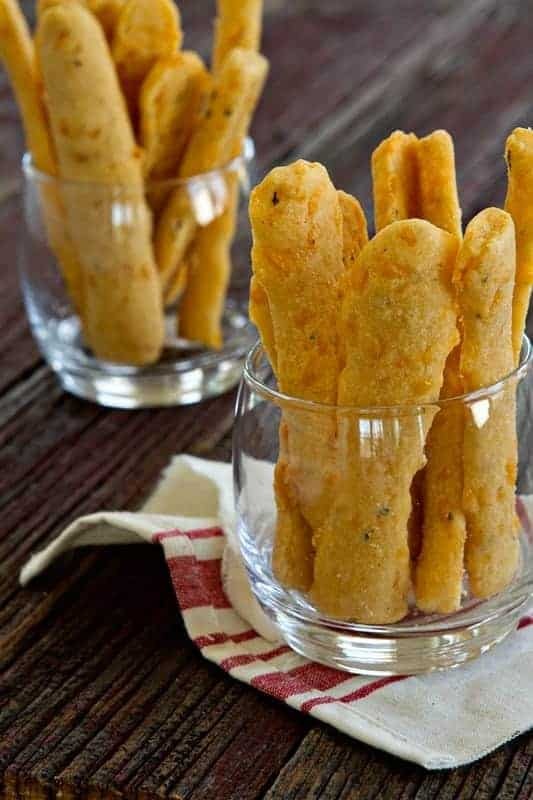 Have you ever had a Cheese Straw? My friend Amber assures me they’re a Southern staple. Until I set my heart on this recipe, I’d never had one. But let me tell you what – Ohioans (and everyone else above the Mason-Dixon line) need to get on the Cheese Straw train. Crispy, spicy, full of cheesy flavor without actually being gooey – this is the perfect snack to put out at your next party or barbecue. I guarantee you they’ll go down easy next to the chips and salsa and homemade dill dip and fresh veggies. A sip of fresh lemonade or ice cold beer to soothe the spicy nibbles makes this whole situation completely irresistible. 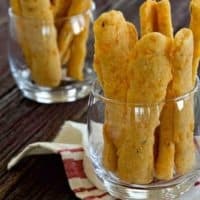 One thing about Cheese Straws, you really have to choose the right cheese to stand up to the spices the recipe calls for. Since I knew I wanted to add freshly chopped herbs to the party, I needed an extra sharp, extra flavorful cheddar. Enter Sargento® Off The Block® Extra Sharp Cheddar. I used the Traditional Cut, which is a bit larger. Great for Cheese Straws, salads, or even omelets and scones. I grabbed a few bags of these new Off The Block® cheeses from Sargento® as I whipped around my local Wal-Mart (gotta love those Everyday Low Prices) picking up our weekly staples. Speaking of Everyday Low Prices, you can snag a coupon for $0.50 off ONE (1) Sargento® Shredded Cheese here. 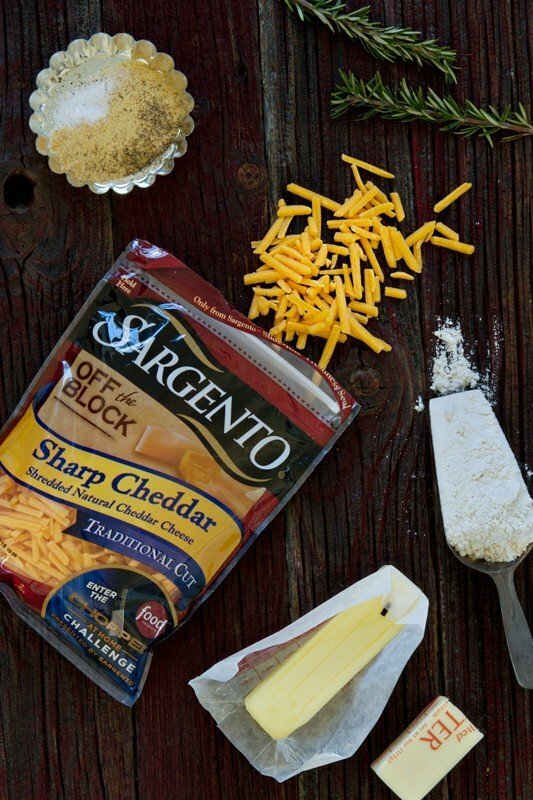 We use shredded cheese quite a lot around here, and I love the convenience of all Sargento®’s varieties and different cut options, because the size and shape of the shred can make a difference when it comes to melting and mixing into other recipes. Like Cheese Straws. I wanted that cheese flavor to shine through. The bigger, Traditional Cut allowed that to happen. I am not kidding when I say we couldn’t stop nibbling on these – they’re seriously like adult gold fish crackers. I left them to cool on a rack in the kitchen, and every single time Eric or I walked by, we snagged one. Before I knew it, the entire batch was gone. G-O-N-E. They’re just that good. You’ve just GOT to make them for your next get-together. This Southern recipe is one that we all need in our arsenal. Have you made them before? 2. In the bowl of stand mixer fitted with the paddle attachment, or in a large bowl with an electric mixer, beat butter and cheese on medium speed for about 2 minutes. Add rosemary and mix to combine. 3. In a medium bowl, whisk together the flour, cayenne pepper, granulated garlic and salt. Gradually add the flour mixture to the butter mixture until a soft dough forms. 4. Lightly flour a work surface and turn the dough onto the surface. Using a rolling pin, roll the dough into a rectangle of 1/2 inch thickness. Use a pizza cutter or sharp knife to cut the dough into strips. Place strips on prepared baking sheet, about 1 inch apart. Bake in preheated oven for 12-14 minutes or until crisp. 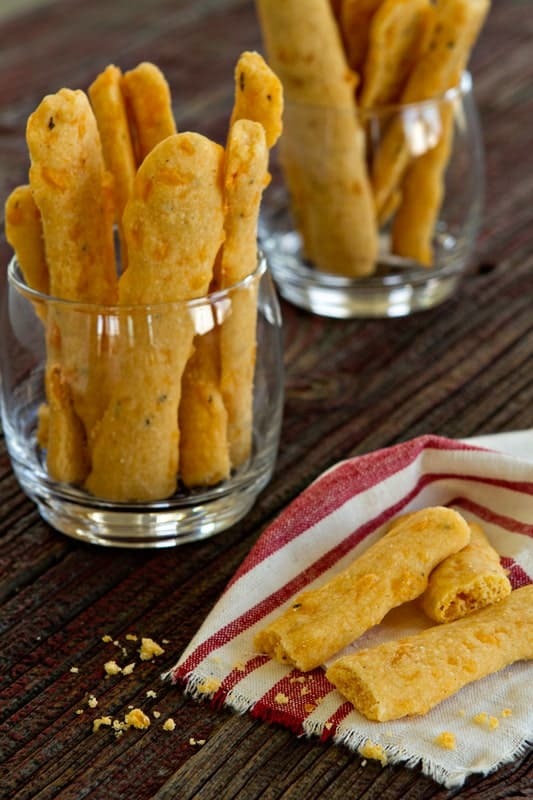 Allow cheese straws to cool and enjoy! Cheese straws are the best! Thanks so much for stopping by. I LOOOOVE cheese straws. My husband is Guyanese and it also a speciality from his country. They make it a little differently and I didn’t know this recipe; I really have to try it! Thanks for sharing! Anna Wyn – webtosucceed.com – Be a successful blogger. I hope you get the chance to try this version. Thanks for stopping by. This was my first time to try them and I’m hooked. I hope you get the chance to try them. Thanks for visiting. I’ve never made cheese straws before! They look like a delicious snack food! The cheese straws are a fantastic snack. I hope you try them. Thanks for stopping by. I love to make cheese straws. They are so much better than store-bought! I have never thought of adding rosemary-what a good idea! Thanks! I loved the addition of the rosemary, I hope you get a chance to try these. Thanks for visiting. Any chance of a gluten free version of this fab recipe in your future? I LOVE your blog and my all time fav recipe is your gluten free Samoa cupcakes. OH.MY.GOODNESS. I’m glad you are enjoying the recipes. Thanks for stopping by and I will see what we can do about a gluten free version. Hi love this cheese stick! They have been a family favourite for years! I have just started my own cake, food, reviews and diy blog and would really appreciate you all having a look! How spicy are these? I love spicy & use Tobassco on almost everything but I’ve got a few in my family that can’t handle spicy. They are not too spicy but you can limit the cayenne to your liking. Thanks for stopping by. This looks like a really simple recipe! I’m sure this would taste great with some sort of sauce, too (maybe marinara?)! Great idea to dip them in marinara! Thanks for stopping by. I just happen to ADORE cheese straws! Extra sharp cheddar sounds PERFECT! They are surprisingly wonderful aren’t they? Thanks for stopping by. love cheese straws with some houmous! I can’t think of anything better! Thanks for stopping by. Trying these for a Graduation party!!!!!!!!!!!! I hope you enjoy them as much as we did! Thanks for stopping by! I only have Cheddar Jack fine cut on hand. Can I substitute with that? Absolutely, Angenell! Let me know how you like it.